The Training Network for Monitoring Mediterranean Marine Protected Areas (MMMPA) is a Marie Curie Initial Training Network (Call FP7-PEOPLE-2011-ITN), funded by the European Commission within the 7th Framework Programme and has started on January 1, 2012. MMMPA aims to train the next generation of MPA scientists and managers, equipping them with a flexible set of skills essential within a wide range of professional environments, including public administration, local authorities, industry and academia. They will focus on the most important aspects that need adequate conservation. 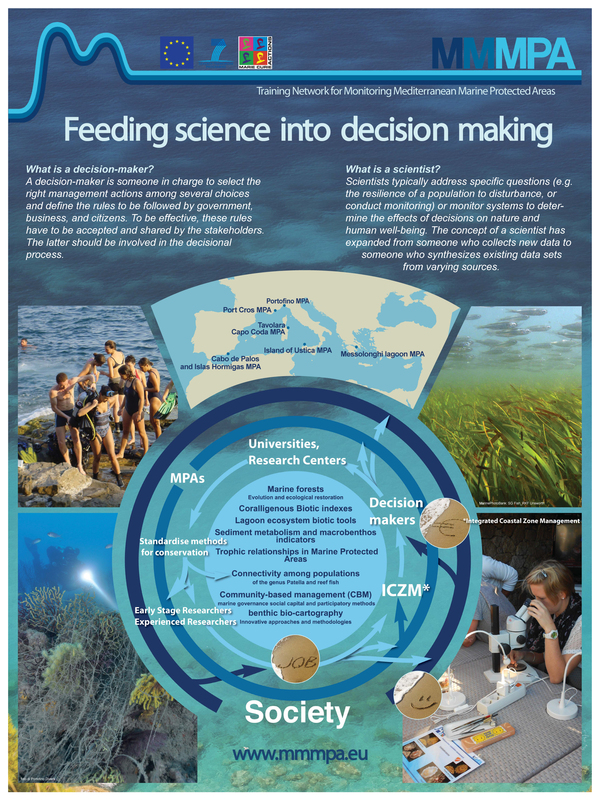 In particular, researchers will maturate the experience to: identify species listed in the Barcelona Convention (Protocol ASPIM, Annex II); monitor their distribution and health state; follow adequate experimental designs; evidence spill-over effects; develop fishery management at the local level, develop management guidelines, engage with stakeholders and the society at large. These experiences will stem from a highly interdisciplinary network, leading in taxonomy, ecology, biology conservation, bio-cartography, and socio-economy. Furthermore, they will be trained in a range of soft skills including science communication/outreach, as it is essential at the delicate interface between science, the management of natural assets and the public at large. Training and hands-on experiences will be delivered by a strong network of world-class experts in MPA management which will provide a highly focused learning environment. The consortium includes 7 Full (5 Universities, 1 Research centre, 1 SME) and 6 Associated partners (5MPAs, 2 SMEs), and will recruit 10 Early Stage Researchers (ESRs) and 4 Experienced Researchers (ERs). Both Full and Associated partners have strong collaborative links with other (MPAs) scientists, professionals and managers and are, therefore, well placed to deliver a comprehensive training network. The planned rotation will expose ESR/ERs to each partner, enhancing intersectoral exchanges and strengthening the Mediterranean Research Area by developing an exciting programme that is attractive to the global research community. The book of Marine Protected Areas from SEDNA on Vimeo. MMMPA - Training Network for Monitoring Mediterranean Marine Protected Areas has received funding from the European Community's Seventh Framework Programme (FP7/2007-2013) under Grant Agreement no. : 290056. However you can change the settings of the service of Web Analytics ShinyStat.